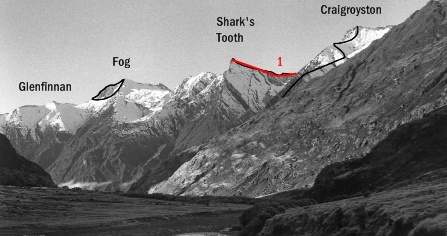 The spectacular spire of Shark’s Tooth was first climbed by Bob Craigie, Phil Cook, Roland Rodda and Scott Gilkison on December 19, 1939. Climb to the col on the Shotover-Matukituki divide. An easy tussock and rock ridge, with snow on its south side, leads north east from the col to the final rock pyramid, which is normally climbed by the moderately steep, rather loose slabs of the West Face or the rocks of the South Ridge. Five or six hours are required from Raspberry Flat to the summit. Avoid following the spur to the Col as is unpleasantly loose when narrow.